We want to design a flyer for corporates that explain our business and provide them with special packages. We want it to be clear and also catchy. Our colors is black white blue and grey. feel free to add swimmers photos or background. it can be colorful but only our Theme colors (black white blue and grey) and use our logo that is attached. use icons for our contact info. We provide tailored aquatic programs for various levels. 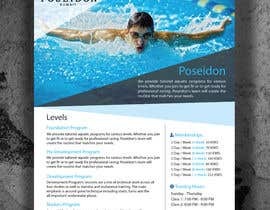 Whether you join to get fit or to get ready for professional racing, Poseidon's team will create the routine that matches your needs. Where students will learn the very basic skills of swimming starting from the how to float. Pre-Development training sessions are about enjoying competitive swimming. The program focuses on fundamental technique & skills across all four strokes and introduces swimmers to challenging training sets. Development Program’s sessions are a mix of technical work across all four strokes as well as stamina and endurance training. The main emphasis is around good technique including starts, turns and the all-important underwater phase. A sound Masters Swim program based at a good location with professionally structured training has been established as the basis for long term commitment. This encourages our Masters to achieve the levels of fitness and technical aspects of all strokes and turns needed to reach and stay at competitive levels. Please include Icons such as location icon, time... etc. Hello, Contestholder, why didn't you rate and reward anyone in your previous contest (social run on saturdays for Poseidon Academy)? front and back or front only ?